Increase profitability, elevate work culture, and exceed productivity goals through DevOps practices. More than ever, the effective management of technology is critical for business competitiveness. For decades, technology leaders have struggled to balance agility, reliability, and security. The consequences of failure have never been greater whether it s the healthcare.gov debacle, cardholder data breaches, or missing the boat with Big Data in the cloud. And yet, high performers using DevOps principles, such as Google, Amazon, Facebook, Etsy, and Netflix, are routinely and reliably deploying code into production hundreds, or even thousands, of times per day. 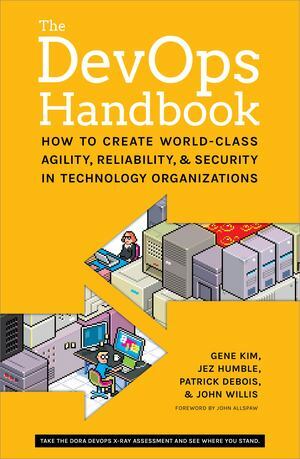 Following in the footsteps of The Phoenix Project, The DevOps Handbook shows leaders how to replicate these incredible outcomes, by showing how to integrate Product Management, Development, QA, IT Operations, and Information Security to elevate your company and win in the marketplace. Take the DORA DevOps X-ray Assessment and see where you stand Visit devops-survey.com with your access code to take the DevOps X-ray Assessment."